The Oral Polio Vaccine Can Go 'Feral,' But WHO Vows to Tame It : Goats and Soda The World Health Organization will start phasing out the oral vaccine next spring. 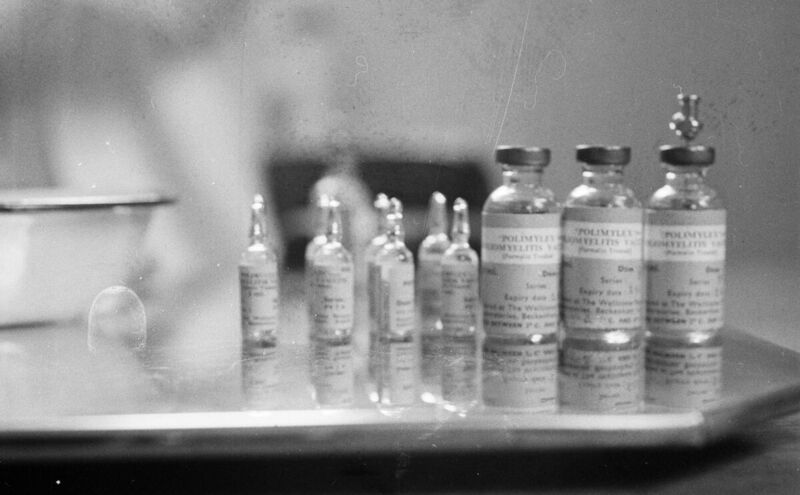 April 1959: Bottles containing the polio vaccine. The oral polio vaccine may go down in history as one of the most powerful public health tools of modern times. Developed by Albert Sabin in 1961, the vaccine is cheap, easy to administer and has pushed polio to the brink of extinction. The joke is that if you can "count to two" you can vaccinate kids against polio. That's because all it takes is squeezing two drops of the vaccine into a child's mouth. But there is a downside to the Sabin vaccine. Unlike the earlier vaccine developed by Dr. Jonas Salk and administered by injection, the oral version contains live polio virus. Under some circumstances, virus from the vaccine can spread, mutate and cause the same paralysis it's intended to block. It starts when a child who's been vaccinated sheds live virus in stool. Like regular polio virus, these vaccine-derived strains fan out in places where there's poor hygiene, particularly when drinking water is contaminated with human sewage. Are you a regular Goats and Soda reader? We'd like to hear what you think of the blog — and what you'd like to see us cover. Will you take five minutes to take this survey for us? Dr. Olen Kew, a virologist at the Centers for Disease Control and Prevention, was one of the first researchers to discover that virus from the vaccine had gone, in his words, "feral." In the year 2000, Kew was investigating an apparent polio outbreak in the Dominican Republic and Haiti. Twenty-one kids had been paralyzed and two had died from an unidentified disease. It seemed unlikely that the cluster of paralysis cases on the island of Hispaniola was actually polio because polio had been eliminated from the Americas in 1991. Kew got hold of samples from the outbreak. When he sequenced the genetic code of the virus he found what researchers had hoped not to see. The virus paralyzing kids in Haiti and the Dominican Republic came from the polio vaccine. There wasn't a label for this type of polio, Kew recalls. Eventually these polio strains came to be called "vaccine-derived." How Did Polio Pop Up In 2 Polio-Free Countries: Ukraine And Mali? In places like Haiti, where polio immunization rates were extremely low, the vaccine virus was able to spread in the community — in this case for two years. At first the spreading vaccine virus isn't a problem. In fact contact with this shed virus can immunize more people in the community. But sometimes the feral virus mutates and regains its virulence, Kew says. "It's a live virus so it has the possibility of recovering its original properties." The number of vaccine-derived polio cases relative to the hundreds of millions of doses of oral polio vaccine administered each year is incredibly low. In 2014, there were 56 vaccine-derived cases reported globally. But 56 starts to sound like a lot when the number of regular polio cases has fallen to just a couple dozen a year. So last month the World Health Organization announced the beginning of a program to phase out oral polio vaccine and eventually switch to the injectable version, which contains no live virus. WHO is ordering every country still using oral polio vaccine to switch to a safer oral vaccine in April 2016. The first step in the WHO plan is to drop Type 2 polio virus from the new oral vaccine. Of the three types of virus in the vaccine, Type 2 accounts for roughly 90 percent of vaccine-derived paralysis cases. Type 2 itself has not been seen in the wild since 1999. Oral polio vaccine is no longer used in the U.S. In the year 2000, American pediatricians switched to the inactivated, injectable polio vaccine that contains no live virus. There isn't enough injectable "killed" vaccine available globally to replace the oral vaccine entirely. Also in some places it might difficult to give a shot to every child in a village. That's why the live oral vaccine containing strains of Type 1 and Type 3 polio will continue. But the ultimate goal is to stop using live vaccine entirely. "The idea of the polio eradication is ... to eradicate viruses whether they're in vaccines or in the environment," says Elias Durry, emergency adviser on polio for the World Health Organization's Eastern Mediterranean region. "To get rid of the virus we have to also remove the vaccine that contains virus." Eventually the rest of the oral polio vaccine used around the globe will also be withdrawn from circulation and the final vials destroyed.